(Nanowerk Spotlight) The particular physical properties that result from their unusual state of matter – they combine the properties of solids and fluids – make hydrogels ideal candidates for a number of applications. Nanoscale colloidally stable particles made from hydrogels are referred to as nanogels and these material systems have many general advantages, such as high transparency, high diffusion rates, high surface area, high dispersion stability, and monodispersity. Researchers in Japan have now proposed a novel photochemical application toward artificial photosynthesis using nanogels as nanogenerators, which evolve hydrogen gas from the internal water induced by irradiation with visible light. Actually, these nanogel systems generated hydrogen gas more efficiently than conventional solution systems. "We have designed photoinduced hydrogen nanogenerators and fabricated them by a novel nanointegration method that uses nanogel as sensitizer and nanoparticles as catalyst," Kosuke Okeyoshi tells Nanowerk. "The nanogels involve a photoinduced electronic transmission circuit to realize a smart photoenergy-converting system." Okeyoshi, a PhD researcher in Ryo Yoshida's Biomaterials System Engineering Laboratory at the University of Tokyo, explains that – differing from microgels larger than the wavelength of visible light – the functionalized nanogels smaller than that wavelength can also be used for the fabrication of photonic crystals as an optical waveguide. "Photonic crystals prepared from nanogels can enhance photon absorption due to the light confinement effect" explains Okeyoshi. "In our recent work, as the first step toward this purpose, our group designed and fabricated a photoinduced hydrogen nanogenerator by integrating the necessary components, such as sensitizer and catalyst, with close arrangement in the polymer network." Reporting their findings in a recent edition of Small ("Photoinduced Hydrogen-Generating Nanogel Systems"), first-authored by Okeyoshi, the team demonstrates that such a polymer network with nanointegration enhances the photoinduced electronic transmission for hydrogen gas generation. To fabricate their nanogenerator, the team first prepared positively charged nanogels as sensitizers and negatively charged platinum nanoparticles protected by anionic surfactant as catalysts. During the swollen state of the nanogels, the platinum nanoparticles are introduced into the interior from the surrounding solution by electrostatic interactions. Then, the temperature is increased while avoiding collapse and aggregation, and the network shrinks to physically immobilize the platinum nanoparticles in the gel. 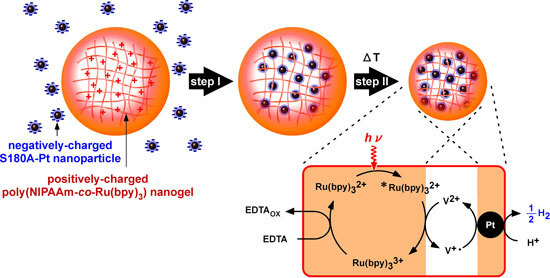 Integration mechanism for platinum nanoparticles and a poly(NIPAAm-co-Ru(bpy)3) nanogel. The positively charged polymer network absorbs the negatively charged platinum nanoparticles (step I), which are immobilized in the thermosensitive network (step II). The poly(NIPAAm-co-Ru(bpy)3) nanogel with immobilized platinum nanoparticles involves an electronic transmission circuit induced by visible light to generate hydrogen. EDTA=ethylenediaminetetraacetic acid (Reprinted with permission from Wiley-VCH Verlag). "This nanointegration differs from the conventional preparation method of using a nanogel as a template, known as in situ synthesis of single-metal nanoparticles in nanogel by reduction or oxidation" explains Okeyoshi. "Our nanointegration method using electrostatic interactions and polymer conformational changes enables the optimal arrangement among multiple functional groups in the nanogel." The electrostatic interactions among the positively charged nanogels and the negatively charged platinum nanoparticles are effective for constructing the nanogenerator. The researchers found that, as the amount of crosslinker was increased, the ζ-potential increased (the zeta potential expresses the electrokinetic potential in colloidal systems). This result indicates that the charge on the nanogel interface easily increases when the swelling of the polymer network is highly restricted by crosslinkers. Experimenting with different nanogel compositions, it became clear that the difference in hydrogen generation for the nanogel systems is strongly correlated with the capacity for immobilizing platinum nanoparticles into the interior of the nanogels. If the polymer network is capable of a spatially closed arrangement for the sensitizer and catalyst, the electronic transmission for the photoreaction is enhanced. Such a polymer network with nanointegration should be useful for the design of photonic devices.